All names used in the MERTS software must first be entered into the Names tab. Common examples of name types include individuals, committees, vendors, candidates, ballot proposals, financial institutions,etc. 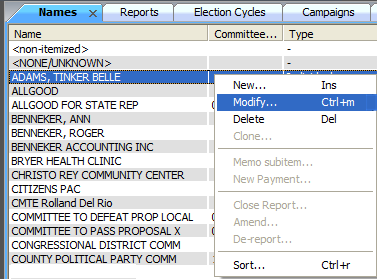 See Helpful Hints at the end of this section to learn more about entering names and for direction on entering names needed for the Campaigns (does not apply to the Candidate module) tab. Select the Add New item icon on the toolbar or right-click any where within the active tab and choose New. A Names window will open. Enter the requested information. Select a name ‘type’. Click the dropdown arrow near the Type section for a list of options to choose from and continue to complete the information. Note: Choose the Get Committee Information here link to find other committee information. Enter the employer information if applicable. 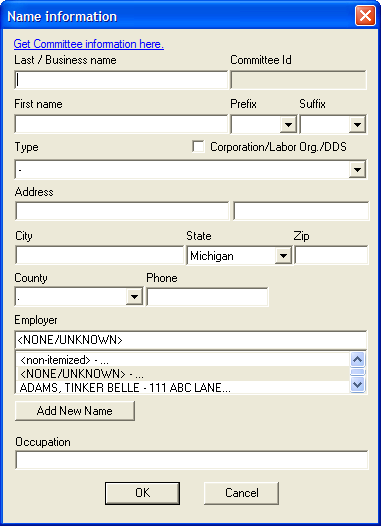 In the Employer drop down list select the Add New Name button as shown below to enter the employer information. Select Ok to save the entry and close out of the name information window. Select Cancel to close out of the name information window without saving new entry. To Modify an existing name record already created right click on the name and choose modify as shown below. Make the necessary changes to the contributor’s name information. 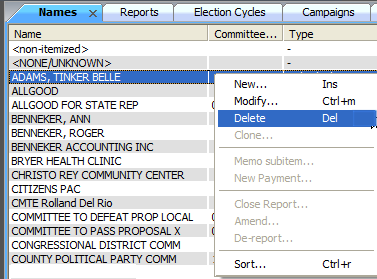 To Delete an existing name record right click and choose delete. Please note if the name is associated with any transactions the system will not allow this record to be deleted. When entering a two party check, each party on the check must be entered separately in the Names tab. This means that a check from Bill and Gloria Smith would require an entry for Bill Smith and a separate entry for Gloria Smith.